Now that the press release is out and we can finally announce the LGBT Foundation project, I want to introduce myself properly. I’m Ben Kubota, the project lead for the ICO of the LGBT Foundation. Let’s start with this right away — I am not the right person to be in the role forever. But I hope I am the right person to set it up and get the approval of the LGBT community to help launch what I think will be an incredible organization that supports the community and advances LGBT rights around the world. How did I get involved, you ask? I have been friends with Christof Wittig, the CEO of Hornet, for many years. When my time with my last company was winding down, I had actually been looking forward to taking some time off. But I was certain that my next project should be something innovative and do something for the greater good. Chris and I had been chatting about the omnipresence of cryptocurrencies in media and how the actual technical innovation — blockchain — isn’t at the forefront as much as it should be. 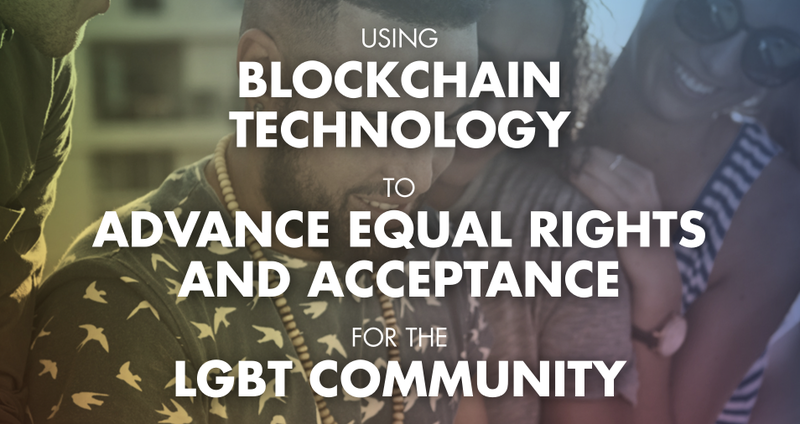 I had been personally involved in the crypto space for quite a few years and when we hit upon an idea that would actually utilize the growing exposure of crypto to build something meaningful, I knew what I wanted to do: establish the LGBT Foundation. After sketching the rough outlines of the white paper that we will be presenting soon, I shared it with Christof and he quickly asked me to head the endeavor in the role of project lead with him sponsoring it through Hornet. With that momentum, and Christof being a member of the LGBT community willing to sit on the board, I scrapped my ideas of taking a break. With all the technical benefits of blockchain, I realized it was a great opportunity to use my expertise to accomplish the two things I was passionate about: innovating with technology and using it to benefit others. That is my goal: to help the Foundation set up LGBT Token and the LGBT Impact initiative. Yet, it’s also my passion. You see, my background is in tech and product development. My CV once described me as “a versatile technologist who excels at identifying niche opportunities in the global marketplace and marrying product and technology with community engagement to drive transformative business growth.” I realize that’s a mouthful, and probably a fancier description than the reality of what I do, but one thing is for certain: all my projects revolved around giving something to the community and trying to build something to better the world. Helping others. My first project was called OMDb, which is nowadays known as The Movie DB — an open API for movie-related information. Consider it the Wikipedia version of IMDb, if you will. I didn’t stay there forever, but long enough to get it off the ground and successful beyond my wildest dreams. That led me to my second project. I was fortunate enough to launch the largest movie community in Germany, Moviepilot.de, with two of my closest friends. A few years later, we launched the English language, U.S.-based version of the site, Movie Pilot. We then successfully sold the German site in order to concentrate on making Movie Pilot grow between our offices in Berlin and Los Angeles. Shuttling back and forth between two hemispheres of the world wasn’t easy, but it was worth it because I believed we were building something good. That included projects I’m proud of, such as our Creators Fanzine: LGBT Edition. It had always been a dream to create a place where passionate fans could come together to share and write about their love of entertainment, sports, video games, comic books, and pop culture. And so my last project, Creators.co, was built as an extension of Movie Pilot do to exactly that. Our dedicated team built a tremendous community of fans whose knowledge and passion astounded us every day. With our Creators Academy, high school and college age kids who wanted to learn how to write about entertainment for a living could complete a set of custom courses then work one-on-one with our professional editorial staff and get paid for it. Unfortunately the project didn’t ultimately make enough to pay for itself, but I will always be proud of what we accomplished together. Many of the aspiring writers who came into our program are now putting their skills to use elsewhere, whether in college courses or working at other digital media outlets and blogs as entertainment journalists. Yet life has a funny way of proving that when one door closes, another opens, and it led me to launching the LGBT Foundation. So now here we are. I, a tech and crypto nerd that cares about communities, have a chance to create a project that I am deeply passionate about. But I can’t do it alone. I may know tech and crypto, but I can only fulfill half the role. I am an ally, but not a member of the LGBT community, and I firmly believe that the person who ultimately ends up in charge of the Foundation should be a member of the community. The governance of the LGBT community belongs in the hands of the community itself. So in that capacity I am here to bootstrap this endeavor and establish the infrastructure of the Foundation until I can hand it off to a trusted team. Consider me the temporary custodian of the Foundation. For that, I need your help to make sure the project is aligned with both the LGBT community’s and the crypto community’s best interests. It is a fine line to strike the right balance between two communities so seemingly unrelated. I am aware of that. That’s why we decided to open the discussion with all of you very early on. That’s why I want to hear your thoughts, your ideas, your concerns. Please join me on Reddit or Hornet, so that we can work on this together to achieve a number of incredible things: Innovating and advancing what’s possible in the world of cryptocurrency, and in doing so, make a difference for equal rights and the rightful acceptance of the LGBT community around the world. Thank you for letting me steer this ship until we find the right captain. I look forward to going on this journey together.